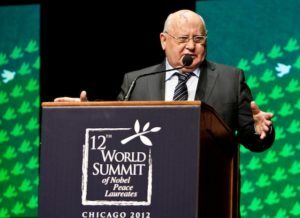 Nobel Peace Laureate 19990, Mikhail Gorbachev (born in 1931), President of USSR. He won the Nobel Peace Prize for his advocacy for nuclear disarmament and the strengthening of global security. In 1985, Mikhail Gorbachev was appointed the First Secretary of the Communist Party of the Soviet Union. Soon afterwards he announced “perestroika”, a policy reform which aimed at democratisation of the state and moving towards a market-oriented economy. The reforms were never fully implemented but they were conducive to the end of the Cold War and the collapse of USSR’s satellite communist regimes in Central and Eastern Europe. In March 1990, Mr Gorbachev was elected the first and the last President of the Soviet Union. He resigned from the office in December 1991, following the collapse of the USSR. “Preparing for my address I found in an old Russian encyclopedia a definition of “peace” as a “commune” — the traditional cell of Russian peasant life. I saw in that definition the people’s profound understanding of peace as harmony, concord, mutual help, and cooperation.